January 28, 2010 by Scott B. In this episode, Steve Evans uses every opportunity available to remind Scott B. that he is a noob, and that his wife likely hates him. While Steve explains how much he enjoys loon commenters and opines on the true identity of MCQ, Scott gets a little help from his friends John C. and Kathy Soper. 3. Local man eats only Chipotle burgers for a week straight. 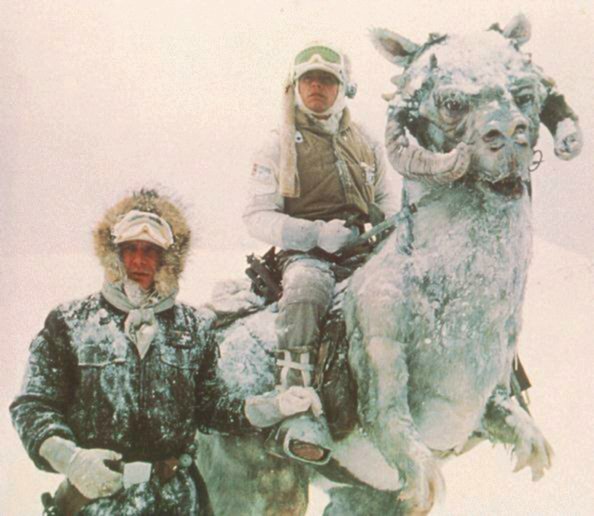 FYI, in the picture, Steve is on the Tauntaun. I’ve always thought Evans looks like Guybrush Threepwood. Not so much like Luke. Just sayin. Scott, the genius intro compensates for your incomprehensible hatred of cheddar cheese. Honestly, Scott, I don’t think people should believe that you like cheese at all. la la la can’t hear you. My wife really loves Chipotle, so we get that a fair amount. And Scott, you can tell B. that I watch The Bachelor, too (a guilty pleasure). Could someone fix the link in the post? That’s just embarrassing. No wonder the exmos are beating us! To which link do you refer? You know what’s good? Smoked cheddar. I’ve never eaten at Chipotle. Well, I finally figured out I can subscribe to this junk on iTunes. This is a positive thing. meems, I will have an actual iTunes Store feed set up soon. For the moment, folks can just use the Delicious feed in the right sidebar to subscribe in iTunes. Well, someone fixed the link. Now, if we fail to win, Scott has only himself to blame. Scott you’re the first human I’ve ever heard of who neither (a) is vegan, nor (b) likes cheddar. I have to conclude you’re not human. Your half-hearted attempts at assimilation are also evident in slip-ups such as calling a “burrito” a “burger.” Let your alien overlords know you need more classes or something. I agree that Scott needs more class. Scott, pay no mind. John’s just protecting his space. Ok, you know, there are a lot of possibilities for fictional characters in the nacle. I personally am operating under a theory that there are only about 5-10 real people in the nacle, and the rest of the bloggers and commenters are just fictional creations. But to claim I am fictional, and being written by Kristine(! ), is obviously just the product of an overwrought imagination. I mean, if that were true, I would be a lot better written for one thing, and I would have all kinds of musical talent for another. I’m actually being written by mfranti. Sorry she’s not better at it. You’ve so never been there Scott. I protest! I’m completely innocent! If I was going to create a fictitious character, especially a male one, he would be a lot better looking and much more sensitive to my feministy-female needs. MCQ is obviously the fictitious creation of some lower-brow blogger, not someone with my talent and sophistication. And, Kathy, as far as I’m concerned you can pronounce MCQ however you want, as long as you spell it correctly and vote for him in the Niblets. I protest as well. Whoever is creating that fictitious loser, it’s not me! Have you seen his comments over at fMh? We’ve debated sticking his sorry fictitious a** in the mod que until he learns some virtual manners. I’m glad I know now that he’s fictitious. It will save me a lot of time if I delete him from my facebook account. I kinda think he’s hot (In a fictitious, virtual sorta way). It appears that Steve and Lisa are fighting over you. Oh, he’s the man, no question about it. Wish I’d created him. So far, I’ve only been able to create one fictitious character, and Steve won’t even let me use her on this site. Ok, I confess, I created him. And Jason Wharton created all of us. Kaimi, taking credit for others’ work is beneath even your usual low standards. As everyone at my blog knows, MCQ is a joint creation of ESO and I. We were having a lot of fun with it but I’ll me damned if I’m going to allow you to take credit for our prank. Nice try though. Suddenly, the damnation I received yesterday feels a lot more effective. Jason Wharton did nothing save what he has seen me do. Before Jason Wharton was, I am. #22 was somebody else. I, the real Kristine, know that it should be “if I _were_ going to create…” Harumph. Don’t pay any attention to that fake Kristine in #36. I’m much too polite to point out gramatical errors in another person’s comment. Someone here has no sense of humor. Wow, both #36 and #37 are *really* convincing impressions of Kristine. But since #22 got here first, I’m going to have to go with that one. You’re confused–the McQueue was the rejected name of the McRib. McQ’s wife was formed when Jason took one of his McRibs from his side, signifying that they are equal. And McQ is to preside. MCQ’s sandwich is the McRib, because he is the presiderer. Kristine’s sandwich is just the help-meat. You mean the Q abides. Well “preside” actually doesn’t mean “preside,” as we all know. Sure we do, Russell, just ask Rusty. Rusty? You mean my little brother’s toady? Pshaw, as they used to say in comic books. Getting back to the topic of the Zeitcast, why is Darth wielding the light saber one-handed when he duels with Luke at the end of Empire? Didn’t the makers of that film have any notion of what those things weigh? You’d throw your back out swinging it around like that. Your brother turned Rusty into a Toad? Oh please, do keep up, Scott. RAF, Vader has a back support mechanism built into his suit, like a girdle. No wonder he wears the cape: to hide the unsightly bulk. Is toad really the secret ingredient of a McRib? Vader’s fighting style was really something of a mutt–he couldn’t be contained in a single style because his natural choice–Shien–required so much acrobatic maneuverability that his cybernetics couldn’t keep up post-burn. Utlimately, he incorporated some elements of Ataru and Juyo as well. OK, just finished the Zeitcast. Good work. A solid 7.5. Nice intro and outro. But that ending with Kathy crying because she got feet-dusted was brilliant. I was busting a gut! Awesome work. I listened to it twice and laughed just as hard the second time. Good work. A solid 7.5. Steve, where is your bannination stick? I thought Hunter was grading us out of 7. That’s right–I forgot. Hunter is from Idaho, and likely only knows how to count to 7. Scott, where are you from? I shake the dust of my mouse in your general direction. Hunter, have you seen my bio pic? That’s my dad. Kathy, I am your father. I thought MCQ was begat by the midiclorians. Scott says, “Your brother turned Rusty into a Toad?” and NOBODY responds, “He got better.”?! A crime against comedy!! Someone call a Hague tribunal. Do not seek the treasure. No man know my history. Dude we don’t even know your present. So are you Kristine or aren’t you? You had your chance to find that out when I was in SoCal, but you blew it off. Now you may never know. I can’t believe you folks are hassling the director of Terminator: Salvation. Anyone associated with that travesty deserves to be (Mc)ribbed. Thanks. I love you guys, too. It’s just one guy, Jack. And he’s a robot. Oh. Well. At leassst he’s not one of thossse lizard people. Fair enough, John. I’m glad that your teammate’s victories in the meaningless blogpoll are more meaningful to you than mine. I think I’ll just retreat back to being perplexed and slightly amused by the whole ordeal. And for the record, I ♥ the Mormon Expressions podcast. The reason we didn’t talk more about you is simple: you were nominated for talking about erections in the afterlife, and Steve had already filled the quota for genitalia-related jokes (1 per ZC) in the first 30 seconds. Sorry. Better luck next time! Jack, I am confident that you shall recover from this enormous slight. Not getting mentioned specifically in the Zeitcast has happened to many. Dozens, even. Oh, no hurt feelings here, Steve. If you really do make one entire genitalia-related joke per Zeitcast, my day in the sun is only a matter of time . . .
Steve, the real question though is whether or not she’ll get over not being mentioned in the ZC if she ever finds out that I cut about 70 minutes of material dedicated entirely to discussion about BJM out of the original recorded file. Jack, did you just compare yourself to genetalia? Come to think of it, BJM does sound suspiciously genetalia-related. Scott B., I think the thought is sweet. Really, I do. But you don’t have to try to beat Mormon Expressions to the punch just to compete with them in the Niblets. You’re swell just the way you are. Besides, I think we can all agree that 2 minutes of discussing MCQ > 70 minutes of me. Well, I had in mind the disproportionate amount of comments I make about genitalia. But sure. It can be that as well. The one where “Jack” is a verb is really good, too. A meaningless episode about the meaninglessness of the Niblets awards. Ironic. The Mormon Expression podcast is very well done. You should try listening to it sometime. I suggest starting with John Hamer and Newell Bringhurst’s episode on Mormon Schismatic Groups: http://mormonexpression.com/?p=419 You’ve heard of John and Newell, haven’t you? You’ve heard of John and Newell, haven’t you? Thanks for the shout out, but I must defend my honor. Please note a few things. 1. Nothing attracts attention like catchy titles, and the fraction of the podcast dealing with the Niblets was really quite small. 2. I didn’t say anything about the quality of Mormon Expression–if you were implying I suggested it was a “bad” podcast. Rather, I just said that I’d never heard of it, and honestly, I don’t have any idea how I ever would have heard of it without the Niblet nomination. 3. John Hamer is so prolific in his blogging, charting, podcasting, and publishing activities, that it is utterly unsurprising to me that I was unaware of an interview he took part in on a podcast I’d never heard of. Cheese is divine. Cheesiness is of the Devil. As is Velveeta. And CheeseWhiz. Even the Prince of Darkness can disguise himself as an angel of light. The ‘Z’ in ‘cheeze’ is a signal for recognition, like trying in vain to shake your hand. Nice podcast. Next time Scott, try talking into the microphone. Sometimes is sounds like you’re recording it from across the room. Also it’s fun to hear you discuss the different people of the bloggernacle. It’s like we are all a big FUN family. And I just want to say of all the strong feminist women in the ‘nacle, Kaimi is the one I want to meet the most! And has MCQ yet told us how to pronounce his name? Because I have always had the same question as Kathryn Soper about the correct promounciation. Like with GST, I know it is supposed to be pronounced “Gust”. I thought it was “gist.” But maybe I’m the only one who gets it. My name is actually never supposed to be pronounced. Like Prince’s unpronounceable musical symbol, it has no audible equivalent. If you must speak of me aloud, you may refer to me as “the one mighty and strong.” Thank you for your inquiry. Thanks, but I’m gonna go with either McQueue or Q-bert. I should point out that it’s totally not true that Tracy and BJM are winning all of the awards. Not to toot my own horn, but I hope you all realize that I’m currently polling 3rd, 5th, 5th, 8th, and 17th in some very important categories. I went to Chipotle’s for lunch and had one of their burgers. It was good. SOUND LEVELS, boys. I was all set to listen to this in the car but somewhere around Milton Keynes on the M1 I couldn’t hear what you are saying! I’ll have none of that, Ronan. I have nothing but amateurs to work with here!